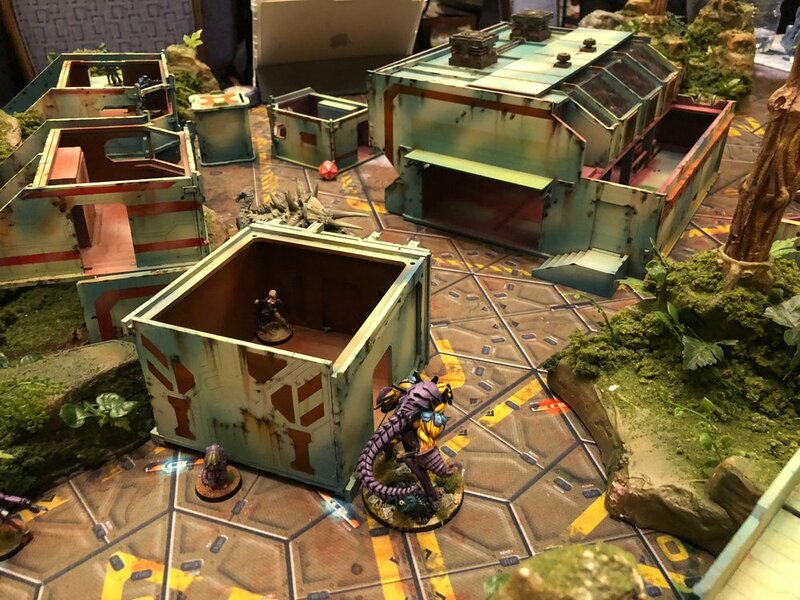 Adepticon Recap, Part 1: Win Big, Lose Big. Adepticon has been my favorite game convention ever since the first year I went. It has become somewhat of a tradition among a few friends and I as an opportunity to get together, play lots of games, and hang out with the upstanding members of the mid-west community, as well as many others. This year I went with a bigger group than previous years, as we have now been joined by Jon, putting us up to 5 nerds flying across the country to play with little dolls. It was fantastic. Brent's parents were kind enough to provide lodging, making this trip both more memorable and affordable. Obadiah (Nehemiah), Jon (WiseKensai) and Pete (YueFei23), shared the room used by the grand-daughters, but they didn't seem to mind, while Brent (Valmiir and I took the big beds. The first day we were at Adepticon, Jon and I arrived in Chicago at 6am, after getting about 1.5-2 hours of sleep each. We went straight to the convention, and had a blast demoing all manners of games, as well as picking up a mountain of JSA boxes and Uprising books. We did have the wisdom to not try and do any events that day, as we were deliriously sleepy. On the second day, after everyone else in our party had arrived, Pete, Brent, Obi and I participated in a 300 point, 4-round ITS tournament. So as you can see, one is a Sphinx list, while the other has the Avatar. Ignoring the names of the lists, I actually used the Avatar list for Firefight, not Frontline. They were both built around going first and wrecking as much of the enemy as I could, destroying their ability to retaliate if at all possible. My first game put me against a USAriadna player named Sean, and if you know anything about me, or have read my blog before, you'll know that I know USA. I was pretty confident about the match up, as I know that USAriadna doesn't have a lot of tools to directly engage the Sphinx at range, as long as I can keep flamethrowers off of him. The table was a gorgeous city table, with a large train, as you can see above. Our game was relatively quick, I took first turn and used it to decimate his forces, putting nearly every single order into the Sphinx, before putting it back into camo. He attacked back with what he could, but the Q-Drone with supportware proved all too effective at repelling his attempts. The game ended in the second turn with the USAriadna army in retreat, and my army unscathed, 9-0 victory. Sean was incredibly enjoyable to play against, and I missed seeing USA on the table. My second game was just brutal. We were playing Firefight, and my opponent, Travis, was fielding a 10-order Bakunin army. I went first and my initial orders involved killing his Task Master Lieutenant, which was left out on ARO duty, killing his Riot Grrl Missile Launcher, and then Sepsitorizing a Zero that opted to reveal and shoot my Avatar with a combi rifle. Next I walked to the building, which he had holed up his Riot Grrls, and he opted to fire with the three of them who could see my Avatar, and I returned the favor by Sepsitorizing them. At this point, I had either killed or Sepsitorized all but 3 models in his army, and still had plenty of orders to finish off Avicenna, the Uberfallkommando, and the last Riot Grrl. My opponent conceded at this point, which I had no objection to, as he was clearly not having an enjoyable gaming experience, and I didn't want to belabor the point by making him play out the rest of the game with no models, while I moved my Obsidon Medchanoid across the board to d-charge a building for my classified. After the game I took some time to explain what he could have done better, and tried to defend the Avatar as not being that bad, though I'm afraid after it all, he had a very negative impression of both the Avatar, and the game as a whole. Despite having won my previous games, I wasn't feeling super confident, neither of my opponents had previously faced the threats that I brought to the table, and I definitely gave my second opponent a negative play experience. I brushed all that off and approached this round anew. I was paired against a great guy named Ernest, and we started rolling dice. I got first turn with my Avatar, which I was very happy about. Care free and high on sepsitorized cubes, the Avatar walked up the board to engage a Fusilier link with a missile launcher set up on ARO duty. I wasn't at all worried about this roll, my Avatar loves this fight, I was in his +0 range, but in my +3, I had ODD, and Cover also working in my favor. This should be a piece of cake, right? Well, he crit me with the missile launcher, and I failed both saves, putting the Avatar unconscious. Not to fear though, I have plenty of orders, and a clear path to advance a Slave Drone to go repair the Avatar. The Slave Drone moves into base contact and brings the Avatar roaring back to life. Not wanting to risk marching around with a single wound, I spend an order and continue to repair the Avatar. I promptly fail the WIP 14 test, knocking the Avatar unconscious. My next order to repair the Avatar again also fails, killing my Avatar... on the top of turn 1... during my own active turn. The rest of the game went predictably, but Ernest was such a great opponent, that I just kept trying all that I could to get a point here or there, but to no avail. By the end of the game, I had a mere 29 points of models on the table, and he won 10-0. One of the great things about coming to events like Adepticon is that you get to fun into familiar faces from previous years. This round I was matched up with Andrew Muir, who you may remember I played last year as well, and he was one of my favorite people that I've met while traveling to events. We talked a while in the hall, and were happily surprised to be paired up in our final round. After catching up a bit, we got to rolling some dice. In this final round, we were playing a bit loose and casual, which probably lead to some amateurish, but incredibly entertaining mistakes. We took turns slugging each other with our armies, taking out units here and there, but what really stood out was that 2 of his 3 turns, he was able to critical Overlord against my Sphinx! As the custody battle ensued over the Sphinx, it occupied the majority of our attention, and little else went down on the table. When the dust settled, I was able to scramble the Sphinx across the table and hold his zone, but he was able to hold the middle and my zone, ending in an 8-4 victory for Andrew. This was by far the closest game of the day, and an incredibly enjoyable one. We decided that we should get dinner the next night, and his group and mine ended up meeting over margaritas later in the weekend. Well, as I expected from the weekend, I both won big and lost big, but overall had a great time. I'm glad I brought the armies I did, and despite what happened in the third round, with the Avatar just crapping itself, and Dr. Worm being demoted to Mr. Worm, I was happy with my overall performance. It may not have been my best showing, but there is an inherent risk in taking armies like the ones I took, and that risk manifested in that third game. It's bound to happen eventually, and you really can't let those things affect your opinion, you just need to accept that it's part of the risk of big scary units. The Avatar is a brutal killing machine, 60% of the time, it works every time.